iSEM is brilliantly and respectfully realised, and sounds truly gorgeous; and with AudioBus and Inter-App Audio also on the feature list, it's a must-have for any iPad musician. Accurate modelling. Sounds brilliant. Nice effects and performance additions. Nothing to argue with at this price. 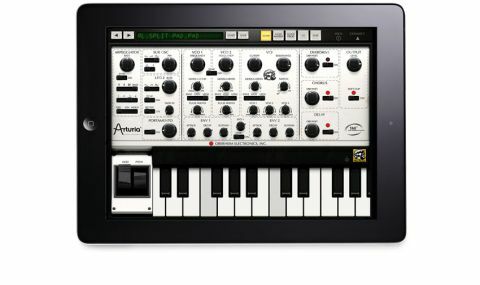 The French masters of vintage soft synth design have ported most of their Oberheim SEM V emulation over to iPad, and with it, the pantheon of essential iPad instruments has expanded by one. Released in 1974, the SEM was a two-oscillator monosynth intended to be used alongside or layered with other synths in a "beefing up" capacity, but much loved as a self-contained instrument in its own right thanks to its rich, warm, characterful sound. "Built on Arturia's repeatedly proven TAE technology, iSEM has all the features of the original synth, plus a number of tasteful enhancements"
Built on Arturia's repeatedly proven TAE technology, iSEM has all the features of the original synth, plus a number of tasteful enhancements aimed at improving its architecture and making it perhaps more relevant to the contemporary musician. iSEM's Main page is where most of the patch building takes place. Its two sawtooth/pulse oscillators are complemented by the addition of sub oscillator with sine, saw and square waves, and a white noise generator. The filter accurately models the all-important band-pass/reject, low/high-pass sweeping and selection of the real thing, and sounds great doing it. The modulation setup comprises the two three-stage envelopes and sine LFO of the original, plus an extra LFO with sine, saw and square waves, tempo sync and retriggering; and assignments are made in an eight-slot mod matrix. Chorus, Delay and Overdrive effects polish up the sound nicely, while the arpeggiator and Performance page, with its four assignable touchstrips, bring plenty of movement and rhythm. Finally, the Voice Programmer section throws in the wacky programmability of the Oberheim 2 Voice, 4 Voice and 8 Voice synths (stacks of SEMs, essentially), enabling up to eight parameters to be independently set for each of up to eight voices. It's quite an odd, archaic system, but quirky, fun and creative nonetheless.